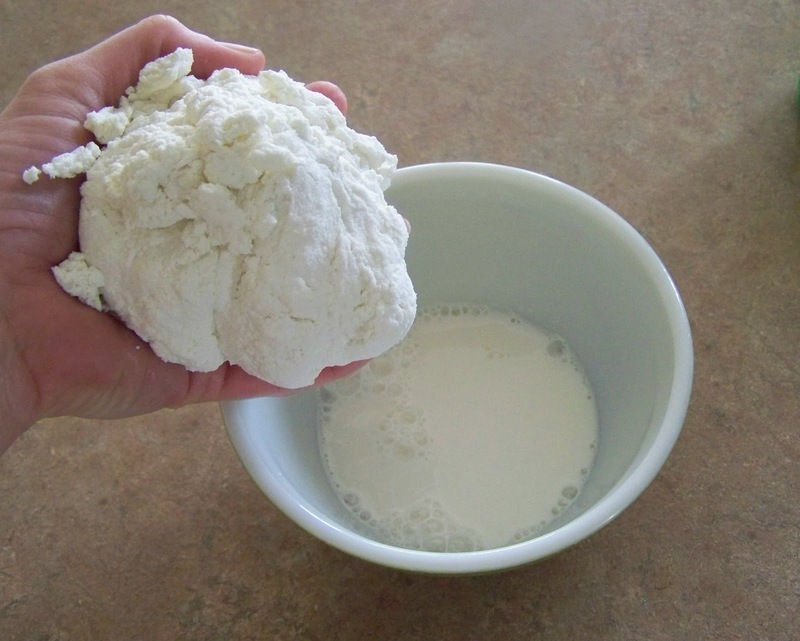 Making homemade cottage cheese is so much easier than you might think. If you are like me, you may not have tried to make your own because you either didn't know that you could, or because you'd heard that you must have an ingredient called "rennet". I've not searched for rennet in my local store but it's not an item that I've ever stumbled upon. It just sounds like an ingredient that would need to be special ordered! 1) Heat 1/2 gallon of milk on medium heat, stir slowly and constantly until the milk is approximately 120 degrees F. Macheesmo didn't have a thermometer, and I didn't either. He said to heat until the milk felt warm. I just heated the milk until it felt as warm as I like my showers. 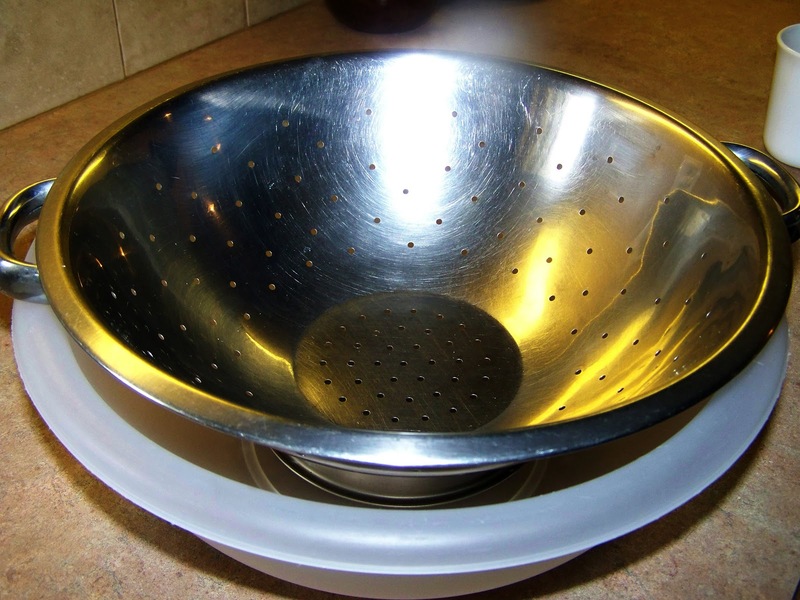 2) Place a colander inside of a larger bowl to catch the whey that will soon be separated from the curds. 3) Line the colander with a tea towel, cheesecloth or similar clean cloth. I used a clean baby blanket, the receiving type. 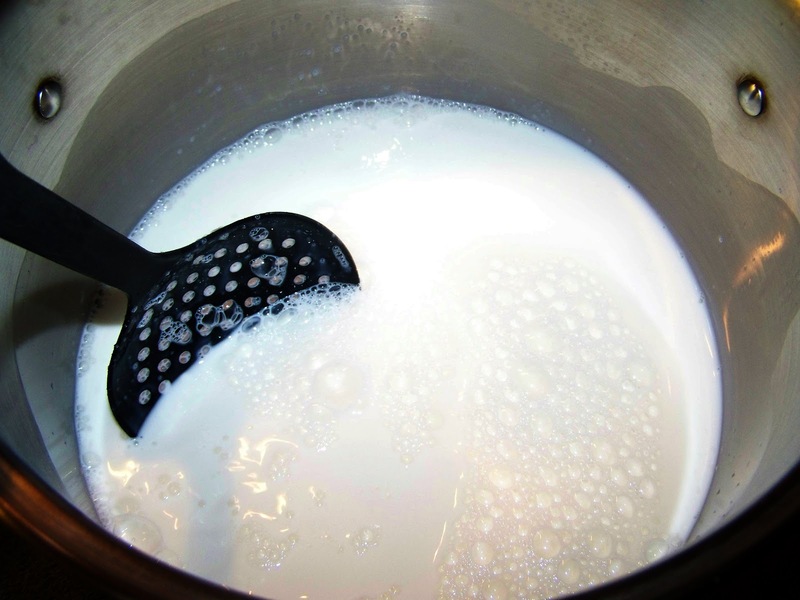 4) Once the the milk has reached 120 degrees, remove from heat. Pour and gently stir in the 1/2 cup of vinegar. Immediately, the milk will start to curdle. Very cool! Your concoction will look like this. 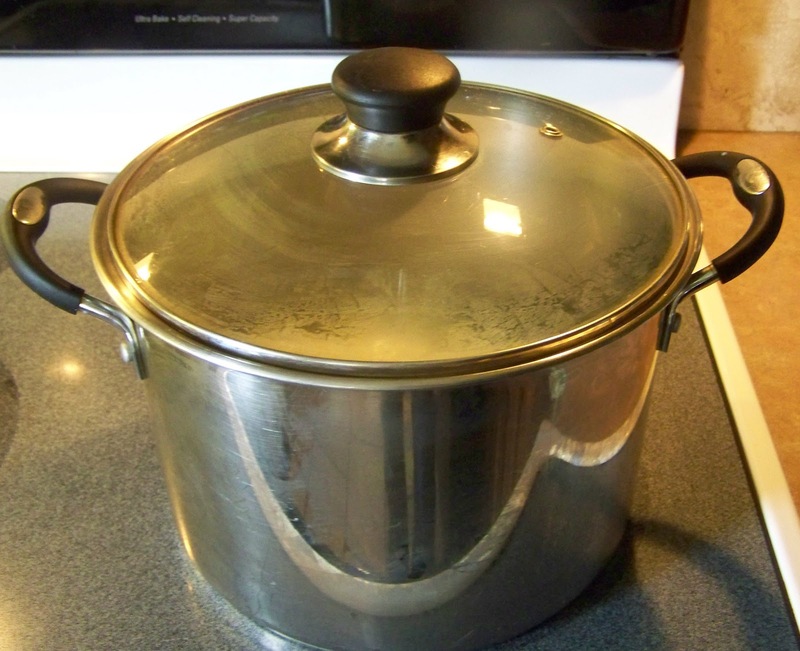 5) Put a lid on the pan and let sit for 30 minutes to cool down and firm up. 6) Pour mixture (gently) through cloth lined colander. 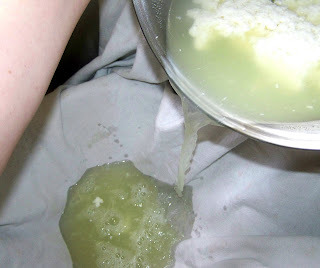 7) Remember to remove bowl with whey and rinse the curds in cold water. I used my (clean) fingers to separate and rinse the curds. 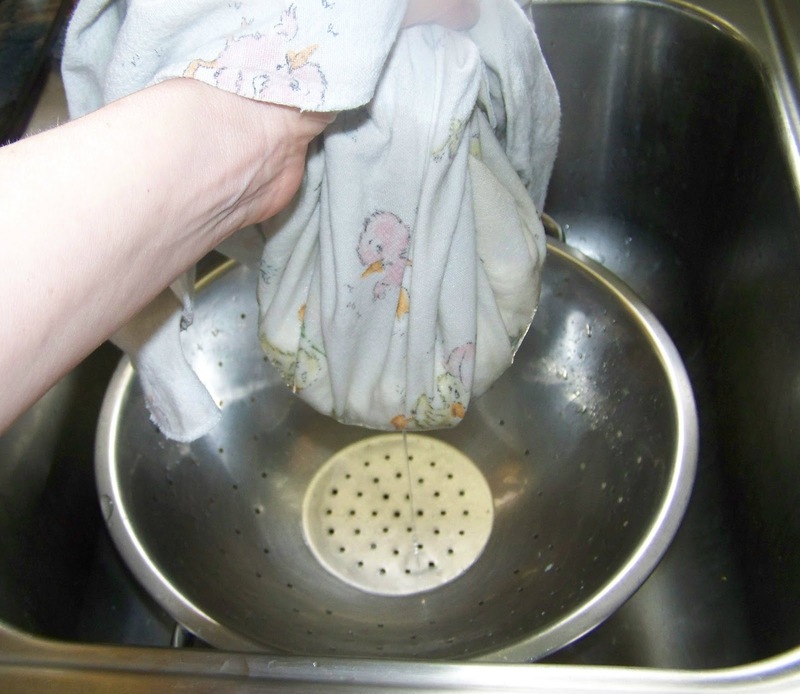 The rinsing helps remove the vinegar and cools your cheese down even more. 8) Gather cloth and gently squeeze out excess liquid. 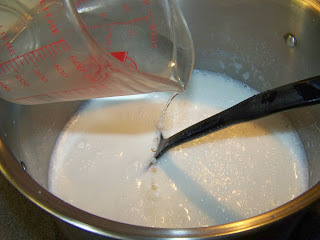 Add curds to the milk (or half n half) and salt mixture. 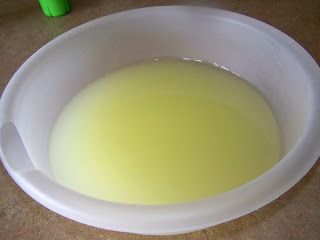 11) Gently stir mixture. If it seems dry, you can add more milk or half-n-half. Recipe made approximately 2 cups. 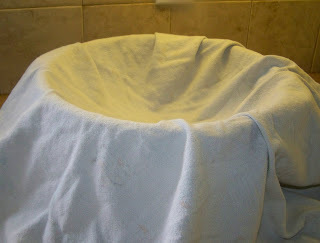 12) Cover and refrigerate. This photograph was taken for informational purposes only. Afterward, we basically ate the whole thing. 13) Save your whey to use in bread, shakes, soup, etc. 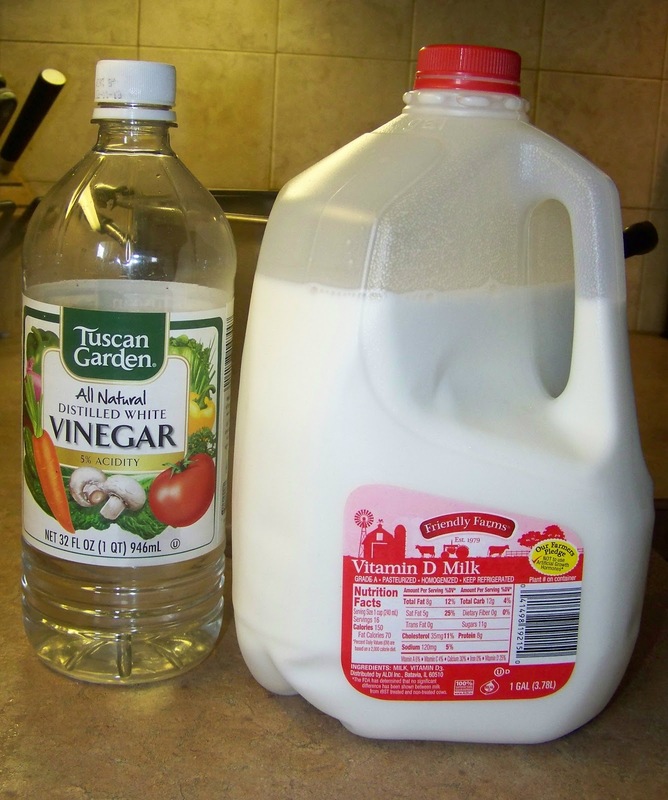 There are plenty of great ideas online on how to use this nutritional liquid. I made bread with mine. It was very tasty! Happy Food Saving and please remember to subscribe if you enjoyed this post! Mine turned out kind of rubbery and very bland - wonder what I did wrong? Oh dear! I don't know but I'll do a little research as to why that might happen. Rubbery and bland is NOT good. The only reason that I could find for causing rubbery cottage cheese is overheating it. Perhaps you got it a little hotter than you realized or left it on the burner even though you turned the heat off? If not, I honestly don't know. I'm definitely not an expert on cheesemaking. As far as the blandness, maybe you could use a little more salt or not rinse it quite so well. I didn't rinse mine as well as the instructions said and I enjoy the slightly tangy taste from the residual vinegar. I do hope you'll let us know if you try to make it again. I got great results with mine. I made this and it came out great! The cheese I made tastes like a cross between cottage cheese and ricotta, leaning a little more towards ricotta in both texture and flavor, to me anyways! THIS IS SO MUCH CHEAPER THAN buying cottage/ricotta at the store!!! I used a gallon of whole milk, 1 cup apple cider vinegar and it made about 4 cups of cheese. There was a lot of whey left so I made cabbage soup with it since cabbage soup broth needs vinegar in it. I just omitted the sauerkraut and used a spiral ham bone, cabbage, bay leaves, onions. It came out wonderful, too!!! Tha whey seems to make a great broth for savory stews! My oldest cat is 15 yrs old and very finicky, yet she ate the broth and some meat! She seemed to like the mild vinegar flavor, too. This is a cat who believes edible food only comes in small cans! make sure to add sour cream or Coconut milk and a little apple cider vinegar to make your cottage cheese have flavor. another reason could be more vinegar than called for....more is not better...I know. Wow all these recipes that cook cottage cheese. My mom used a bag and hung it out on the clothes line for a few hours. Every once in a while she would go out and squeeze it. She liked large curd. Back in the 30's and 40's there were special bags made for it. In step 10 you say to "Add curds to the milk and salt mixture" and i couldn't find the amounts for the 'milk and salt' mixture. Maybe that's why BA's mixture was bland and rubbery. How much milk and salt do you add to the curds? If you have never come across rennet I suggest you get out more. Thanks for your helpful information. Have a great day! Here, you have to order rennet. And then wait a week. And sometimes, dangit, I want cheese NOW. 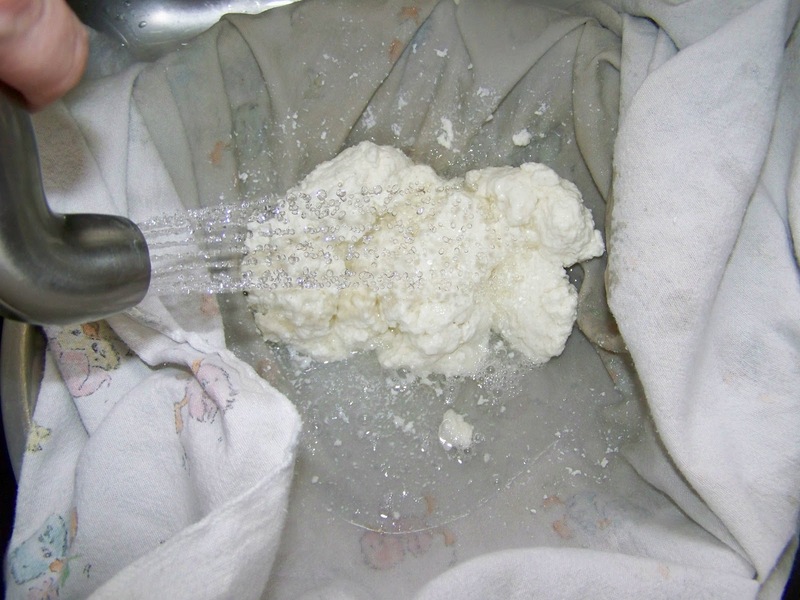 So this is the method I use to make cottage cheese most of the time too. Thank you for being kind enough to share your method, Poppy! I'm sure that many people will be happy to try it! Thank you Corrabelle! I'm glad to hear that you use and like this method too! Have a great week! Don't think I've ever seen rennet in small brown bottles........maybe Anonymous is seeing yeast? I have to order it too! I live in a very small town in NE Arkansas and rennet is readily available at our Walmart. It's in the section where you can find ice cream makers. Although I think the vinegar (or even lemon juice) works just fine....you can buy vegetarian rennet. how would you veganize cheese..? There are nut cheeses out there, but it is a whole other process! 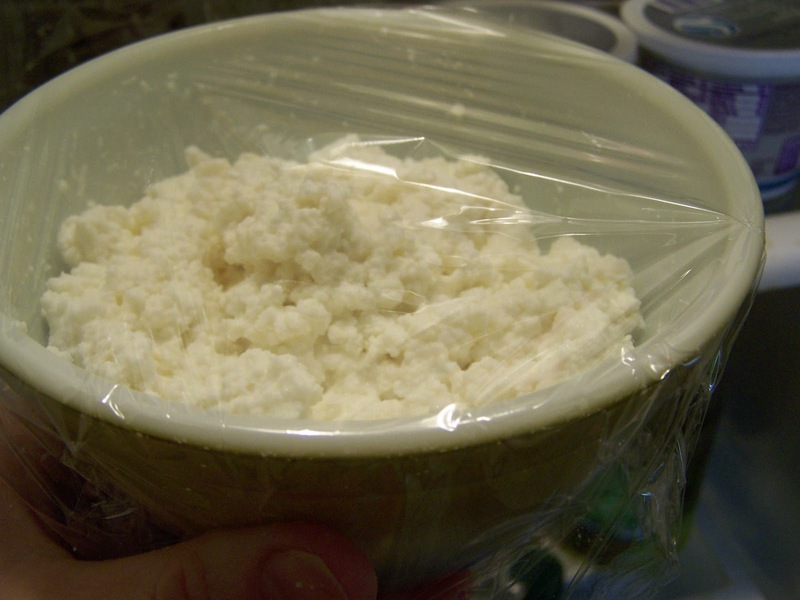 Hi Poppy, thanks for this easy cottage cheese recipe- mine has turned out perfect. I've just used my first batch of cottage cheese to make a low-fat cheese cake, in place of the ricotta which I would normally use. It's baking in the oven as I type! Could you share your recipe of the low-fat cheese cake? Mine came out great! I used 1 gallon of whole milk from Market Basket grocery store (store brand) and apple cider vinegar. The cheese looks and tastes (to me) like a cross between cottage cheese and ricotta cheese, leaning a bit more towards ricotta. The whey made wonderful cabbage soup! Even my elderly cat enjoyed the soup's broth and she NEVER wants to eat people food. fantastic!! i just made a double batch with raw milk from a friends farm and it was perfect :) rich and creamy!! i did need to add a little more salt and that was it :) will never buy cottage cheese again!! 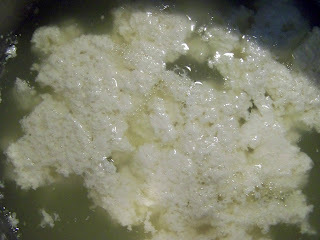 the whey i am going to make ricotta with! Another name for rennet is Junket and is sold as tablets, either in a small box or a tube. Don't know if that's a brand name or just took it from a dessert by that name. Same thing. Much/most of the "flavor" in cottage cheese comes from the culture as in "cultured" cottage cheese. You may be able to find some "real" cottage cheese in the store--one brand is Daisey and all it has is cultured skim milk, cream, salt, and vitamin a palmitate. And it's Kosher meaning it has no animal rennet--also known as "chymosin." You can then "culture your own milk with some of the liquid from that one container of commercial cc into some slightly warmed milk and let it stand for a day--covered, then do the vinegar and salt bit and all the other steps. The "culturing" step or process is no different than what is done to make yogurt or cheese and is what distinguishes one from another--cheddar vs gouda vs rochefort vs gruerre. Each is based on the unique native fungal colonies in a given region. Just like wine. Each produces their own unique flavor. BTW, did you know that back in the "olden" days, bakeries were often located right next to brewery taverns? Same reason--same yeast (fungus). Joe, thanks so much for the really great information! I learn so much from my readers each day! I will definitely use the "culturing" step! thats really good thing i like it. POPPY, I can't wait to try your recipe! JOE, adding the culture sounds like it would enhance the nutrition too, as with yogurt. Is that right? Wonderful idea! And it would add extra flavor too. Here's a RECIPE the turns yummy cottage cheese into a fantastic dip for vegies or chips. Refrigerate for at least an hour to let flavors blend. That sounds amazing, Anonymous! Thanks for the healthy dip recipe! I just tried this recipe with a batch of failed yogurt milk, and it tastes almost exactly like Ricotta Cheese--same texture, too, since I was probably a little over-zealous squeezing out the excess whey. I just love it! I found your page while looking for a cottage cheese recipe for my son's school food technology project. Nice and easy and I had everything in the house, no surprises there, glad I didn't have to go hunting for rennet. From my 2 litres (8 cups) + half a cup of milk I got around 320 grams of cheese (11 1/4 ounces) and about 6 cups of whey. I'm very happy with the end result but I was hoping for a bit more cheese. No cheaper than buying cottage cheese but fun to make. I wonder if the milk wasn't quite warm enough when I added the vinegar as they whey is still quite milky looking, not the watery yellow colour in your photo. I just used my finger to test the temperature, quite warm but not hot to the touch. Anyway, I will try again though and let you know. Your best bet for locating rennet, is to ask your local store manager. Most will be willing to order it for you, if it's not readily available. In my little town, it's located near the ice cream making supplies. 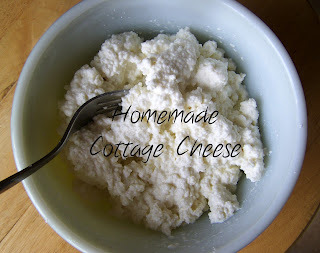 I was so happy to see this recipe as I love cottage cheese, and cannot use rennet. This is pretty much the same way I make paneer, only we use either lemon, or lime juice and the cheese is much sweeter than using vinegar. 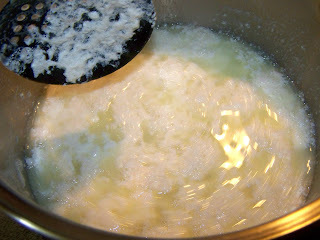 I had no idea that all I had to do was add milk back to my strained and rinsed curds. Thank you for sharing this simple recipe with photos as reference. It has been very helpful to my son who had to make cottage cheese for a school assignment and it turned out great! Now he is doubly excited. Not only did he do well on his assignment, but is looking forward to making one of his favorite foods at home. I live in Southern Calif, and I cannot find Rennet anywhere here either. 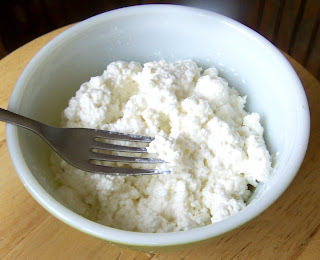 Using Vinegar will make it so much easier to make my own low salt cottage cheese. Thank You for the recipe. This was cool to make. Do you have any suggestions for making the curds a bit bigger/lumpier?? Glad you enjoyed it! My thought would be to handle the curds as gently as possible. Other than that, I don't know. Suggestions anyone? Unfortunatly it didn't work wel for me. Does the milk need to be fresh? I used UHT milk, maybe this was the problem. Nevertheless, I've got some curd, fine though, and from that I made "cream cheese" with spicies. I had 3c of milk starting to sour, so I adjusted the portions and used a candy thermometer to make sure the temperature was correct. Mine turned out fabulous! What a flavor. I'm off to make something with the whey. I had 3c of milk starting to sour, so I adjusted the portions and used a candy thermometer to make sure the temperature was correct. Mine turned out fabulous! What a flavor. I'm off to make something with the whey now. when I was a young girl, I am 69 now, My Mother used to make Smearcase, she called it on the back of our wood burning stove. I am so glad to find out how she made it without Rennet. I thank you for this post. Thnx so much!!! I'M currently living in South Korea where cottage cheese and rennet are impossible to find~~Im very very grateful for your easy recipe that uses ingredients that are easy to find! Many expats abroad will love this recipe veryveryvery much! We LOVE this method here! Thank you so much for this awesome recipe!!! Wonderful recipe for those of us abroad where cottage cheese and rennet are not sold --most people where I live right now have never even heard of cottage cheese!!! I've been craving cottage cheese for several years~n now ur recipe has solved my problem!!! This was just great, I found the cottage cheese a little bland, as the store products seem to have a lot more salt. I will definitely try it again with the apple cider vinegar. Is there any nourishment in the whey, and could you use it instead of water to cook rice for example? I'm only able to get UHT milk here. No cottage cheese here either - but they do sell yogurt. I'm wondering if I could add a little yogurt to the UHT to reintroduce bacteria to make the cottage cheese? Has anyone tried this? I have seen Junket-brank rennet tablets most often near the gelatin and pudding mixes in grocery stores (it is market for making rennet custard.) It come in a small white box, and the manufacturer says it is vegetarian. Some stores stock it near ice cream toppings or on the baking aisle. I made this today and it turned out well using pasteurized milk! Thanks for the recipe! I formed it to a ball and is now in the fridge. It's perfect for Christmas! Also, I made ricotta using the whey. I wanted to chime in for all those other people living in central or south America, where shelf life milk reigns supreme, it seems. I just used a litre of the brand la chiricana, leche entrada (whole milk. My whey can out super clear and bright yellow. I'm using it later for cabbage soup as previously posted in the comments of suggestions. I'm going to write a post about it today, that's how excited I was to discover I could do this so easily, with shelf life milk! My daughter loves it too! I'm so happy to hear this! Are you referring to canned milk or powered milk? I appreciate you letting us know that we don't have to limit our cheese making to fresh milk only! Interesting comments. I live in France and they've not heard of cottage cheese. How do you make the ricotta? Or perhaps there is a post to tell you? Same here in West Africa. There is no cottage cheese and no rennet. I'll make this using powdered milk. We also have UHT milk available but my family prefers a brand of powdered milk that we are used to. Looking forward to trying this. Thanks! Thank you for this, I'm so excited to try it and thanks to all the folks who posted great advice & suggestions. I am so glad that I won't be wasting anymore useless, toxic plastic containers on this dear Earth. This is exactly the way my Great Grand mother made cottage cheese and she came from a French/German family who ran a commercial dairy. I am headed out to the store for fresh milk to make some. I really wanted to make this when I read the ingredients on the commercial cottage cheese and even tho it said 4% milkfat it was made with skim milk. I eat LCHF and I want real whole milk cottage cheese. Poppy, I am trying to pin this recipe and Pinterest won't let me, saying it could lead to spam. HELP!!! Oh Bubby I am having so many problems recently with my blog! After four years of using blogger I decided to purchase a custom domain and it's been one crazy little kink after another! I too have had this happen when I've tried to pin one of my own articles - I tried again from my computer instead of my phone and it let me do it but other than that I have no good suggestion. I apologize and reassure you that I'm working to figure out why all the weirdness since the change of domain. I hope to keep my loyal readers and want to reassure everyone that I don't tolerate spam nor do I create it! Thank you so much for letting me know that you too are having this trouble.